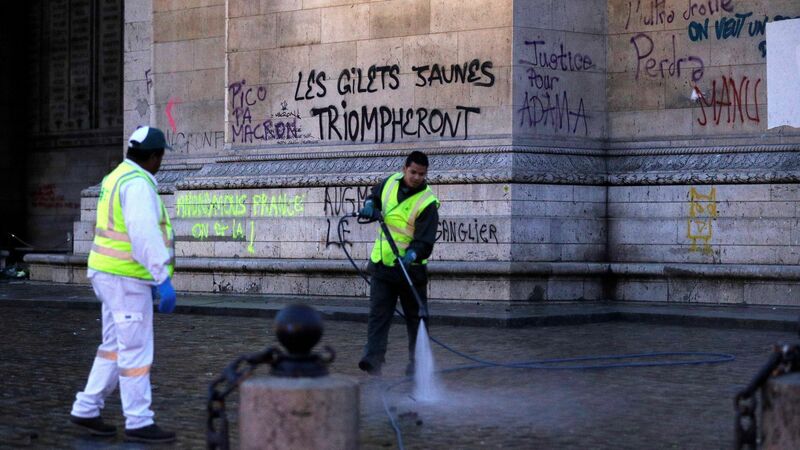 French President Emmanuel Macron visited the Arc de Triomphe in Paris on Sunday — one day after it was covered with graffiti from protestors who are furious with the country's fuel tax hike and high living costs, AP reports. The backdrop: This was the third weekend in a row Paris has experienced riots involving activists who wear fluorescent yellow vests, and Saturday's demonstration in the city center was one of the worst in a generation. Details: The movement started in early November, first centered around a fuel tax increase, though it's now ballooned into a larger push against French policies that the protestors say favor the rich and wealthy, CNBC reports. On Saturday, 133 people were injured and 412 arrested, according to Paris police. 23 police officers were injured in the disturbances. What to watch: Macron held an emergency Cabinet meeting Sunday and has considered ordering a state of emergency across the country. Cars were left in the streets. Remnants were charred. Photo: Geoffroy van der Hasselt/AFP/Getty Images.